Inbound marketing has gotten a lot of press in recent years, as has its favorite child: content marketing. Marketers far and wide tout the benefits of inbound: it’s cost-effective, it’s personal, it builds relationships. Inbound marketing gives us the warm fuzzy feels, too. We like it. And we think it should absolutely be an integral part of your marketing strategy. In fact, the real magic happens when you have a comprehensive marketing strategy that combines and coordinates inbound and outbound. When your inbound and outbound activities are executed in a way that complement each other, your efforts are accelerated and the result is greater success overall. So, let’s break down inbound, outbound, and why you should be including both in your content marketing strategy. Inbound marketing is a method of attracting potential customers by creating and distributing quality content that aligns with your target market’s interests. This helps you gain inbound traffic and build relationships that ultimately turn into sales. Rather than paying to “interrupt” your target market, inbound activities entice potential customers to engage with your brand through more organic means. Costing a whopping 62% less on average than outbound marketing activities, inbound is often favored by marketing teams with modest budgets. Traditional outbound marketing activities promote a product or service through paid advertising channels with the goal of generating leads and/or sales. Outbound is sometimes referred to as “interruption marketing” because outbound marketing activities capture the attention of potential customers by distracting them from the task at hand and compelling them to watch, listen, read, or click. Outbound marketing has come a long way in recent years. In the good ol’ days, outbound was broad, to say the least: outbound activities were generic rather than personal, and they were broadcast far and wide. We didn’t have the technology to pinpoint market segments or quantify the success of one campaign over another. The rise of digital marketing, however, has brought forth a shift in consumer behavior and thus, outbound marketing. The prevalence of computers, smart devices, apps, and customizable settings means that buyers are now in control of their journey – not the advertisers. This is good news for advertisers too, because the guessing game has been eliminated as technology has evolved. A virtually endless supply of tools and consumer data is now in your hands. You can access demographic research and user behavior, A/B test your campaigns, target your ideal market segments, attribute results to their source, and much more. Outbound marketing’s most convincing critics have traditionally pointed to lack of efficiency due to inaccurate targeting or expensive CPMs – but you now have the capability to find and interrupt only the needles in the haystack. The new outbound isn’t just about running ads that promote the features and advantages of your product; the new outbound is a targeted campaign that promotes your relevant, timely, educational, or entertaining content. Why? Because all that data you now have available will tell you that while less than 5% of your target market may be ready to buy, a considerably larger portion of that market is ready to learn, engage, and be entertained. 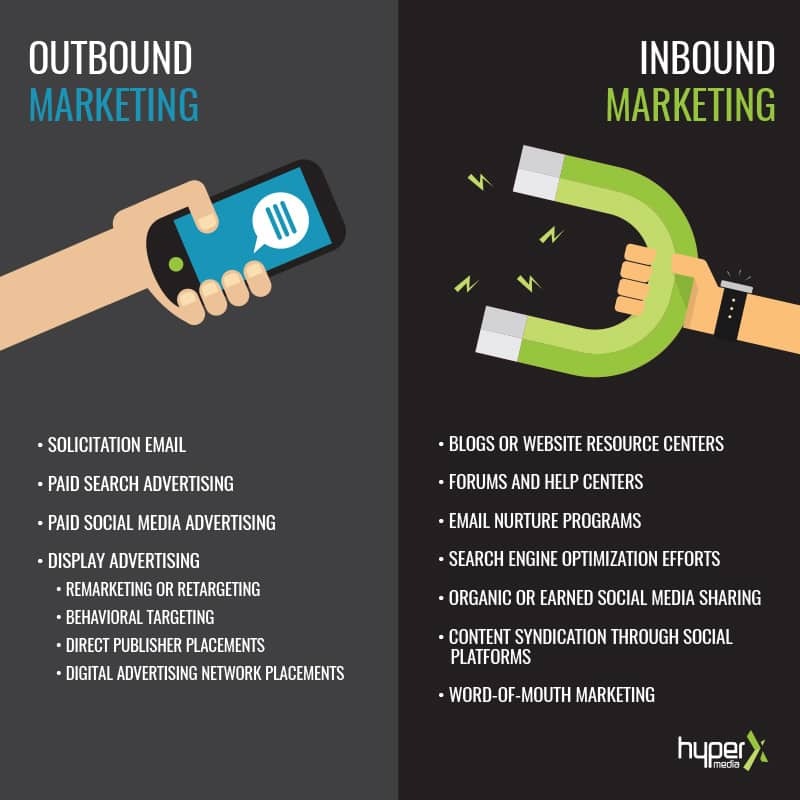 … and that’s where inbound and outbound marketing meet. Merging your inbound and outbound marketing efforts is the no-brainer way to accelerate the slow burn of your inbound marketing efforts. For example, paid and promoted outbound placements can support your inbound efforts by amplifying your reach and helping your collateral get discovered, like promoting a free ebook to Facebook users who have shown interest in similar content. Think about how much more revenue you might see if you accompany your branding campaign with a content campaign, or balance your product promotion with content promotion. You’ll be creating opportunities to reach people throughout the buying cycle. Rather than just resonating with those that are ready to buy, you’ll also be educating, engaging, building trust with, and solving problems for those who are still in the earlier stages of interest. If you implement a nurture strategy, you’ll keep leads in the fold and usher them along the sales funnel until they are ready to purchase. Ignoring the market segment that isn’t ready to buy right now means you’re disregarding most of the market. Rethinking your approach to outbound and using it in concert with inbound will help you reap the rewards of thoughtful, targeted paid marketing efforts. Remember, inbound and outbound are opposite sides of the same coin: marketing. You shouldn’t favor one over the other; rather, you should implement both so you start capturing the full potential of your target market. About HyperX: We’re the marketing experts. We’ve been leading the industry in marketing automation and content marketing since the internet first hit households. We’ve outlived all the other agencies because we’re the best at what we do. Contact us for expert help with inbound, outbound, and everything else.